AndroMouse Server is a simple application that lets you use your Android smartphone as a remote mouse for your computer. To use this program you also need Java installed. Also, your computer and mobile device need to be connected to the same Wi-Fi network or via Bluetooth. You are also required to install the companion app on your Android smartphone. In the main window of the desktop client, you can view essential details about your computer’s IP and server status. There are also several tabs where you can enable password protection for the connection, change how the program looks, set custom keyboard shortcuts and modify the UDP and TCP port. 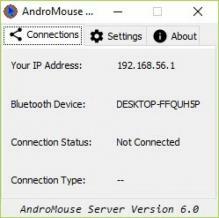 After your computer connects to your Android device, you will be able to use your smartphone as a remote mouse for your computer. Also, AndroMouse Server provides a wireless keyboard and other useful features like a file browser, function keys, speak-to-type and power remote.